On June 4th, 2011, Vancouver Island Fleece Judge, Matt Robley, evaluated fleeces entered by local sheep breeders. Of the 51 fleeces entered in the show, most came from the Fraser Valley. There were entries from further afield but my three entries traveled the greatest distance to be included. Fleeces were sifted by a committee of 22 association members prior to the show. Only those meeting the standards set by the LMPSA were judged. This event was hosted at the Belmont Farm, one of Langley’s heritage dairy farms. The facilities were perfect for the event with lots of room to spread out the fleeces for judging and also space for local vendors to ply their wares. After judging which was open to the public, fleeces were placed on display. Just prior to the sale itself, the awards were announced. I was quite delighted to learn that one of my fleeces had been awarded the Glibbery/Tuytel Spinners Delight award. What could be more fitting than this! 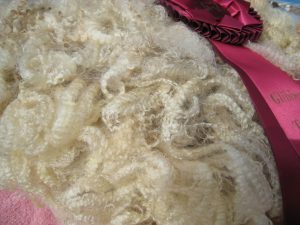 The award was started by the LMSPA to encourage producers to produce fleece that would encourage a spinner and recognize the great local fleeces available. The name of the award comes from two very prominent sheep raising families that have been very active and long time members in the LMSPA. 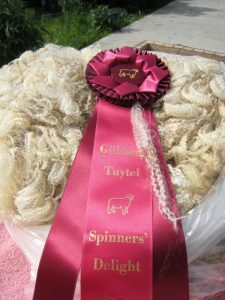 The award does not necessarily go to the fleece with the highest score, but is selected by the judge as the one fleece that he or she deems to be the fleece that would most appeal to the spinning enthusiast best representing the qualities of hand, softness, staple length and luster. It was very exciting to have a Bluefaced Leicester fleece selected. Many spinners in BC have not had the opportunity to see a BFL fleece in the grease and so there was always quite a crowd gathered around the tables. Many cries of delight were heard and I understand that the competition to purchase fleeces was very strong. I think that the fleeces were lovely and well represented the qualities of BFL fibre. Many people are still unfamiliar with Bluefaced Leicester fiber and it is always fun to show them how soft and lustrous it is. It is my very favorite fibre to spin with and I find that more and more folks agree with me. Once you are hooked, you are hooked for the long term. Of special significance for me is the fact that the award is named after one of the Shuswap Spinners and Weavers Guild members, Judith Glibbery. She and her husband made a huge contribution to sheep and fleece production during their tenure in the Lower Mainland and dedicating the award to them was intended to recognize their involvement. It certainly made winning this particular award extra meaningful for me! Click on the photo to take a closer look at how beautiful and clean this fleece is! That is terrific, Margaret! I really like the photo with the lock laying on the red ribbon – shows off that famous BFL crimp. Well done! Không bi?t h?c phí s? ?? ?c thanh toán th? nào ? ?